NASA's Juno spacecraft is currently circling Jupiter, and it is sending back some incredible images back to Earth. It may be one of the most stunning achievements in modern human history: NASA has gotten a spacecraft to orbit Jupiter and send back pictures and data to Earth. It’s the first time June has been able to send back data since entering orbit around the gas giant in July, and the pictures are absolutely mind-blowing. 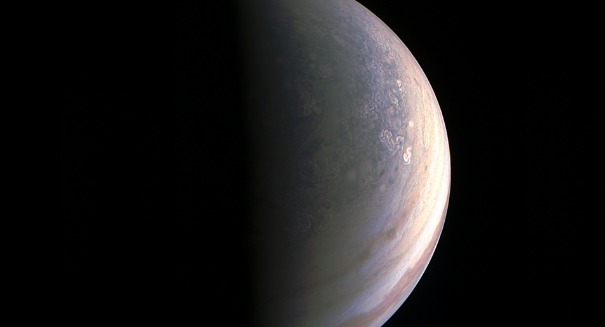 Images released show the swirling clouds at incredible detail, as well as taken a picture of Jupiter from an angle impossible on Earth, showing the bizarre bluish north pole in fascinating detail. The spacecraft also took infrared imagery of the planet that is truly jaw-dropping. Juno took the pictures from 4,200 kilometers away, and so far 6 megabytes of data have been sent back to Earth, which scientists are analyzing. The first pictures show that the poles are very different from what scientists expected, and look nothing like the rest of the planet. Scientists will continue to use the special instruments on the spacecraft to further probe Jupiter’s many layers and understand more about the largest planet in our solar system.